The TurnStyles underground shopping and food arcade at Columbus Circle has blossomed into a hopping venue that reminds me of the great underground arcades attached to subway stations in Seoul and Tokyo. There are several options for dumplings in the arcade and I recently tried Daa! Dumplings which sells Russian style dumplings known as pelmeni. These dumplings are related to Ukrainian varenyky and Polish pierogi, but with pelmeni the dumplings are smaller and the dough is rolled as thin as possible such that the proportion of filling to dough is usually higher. Also, pelmeni are usually stuffed with raw filling before they are cooked, while the fillings of vareniki and pierogi are typically precooked before the dumplings are boiled. In Siberia, pelmeni were traditionally frozen outdoors in the winter and treated as a preserved food that could be easily cooked by boiling them in salted water. The Dumplings: Daa! 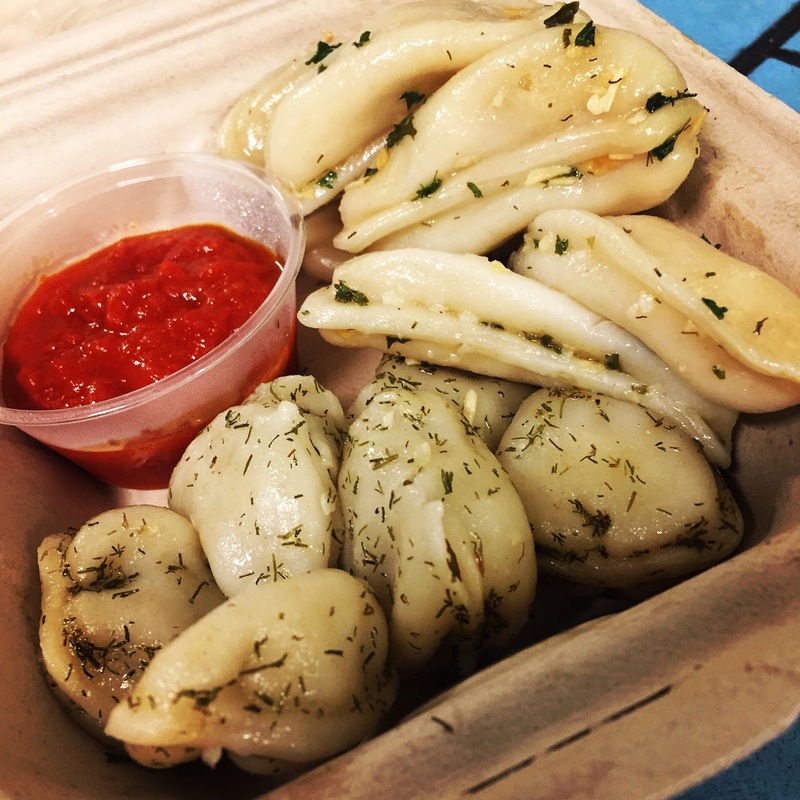 Dumplings sells snack orders with 12 pelmeni and meal orders with 18 pelmeni and they have Pork, Beef, Veal, Chicken, Shredded Beef and Pork, Potato, and Cabbage as filling options. For each order you can choose two styles of dumpling. 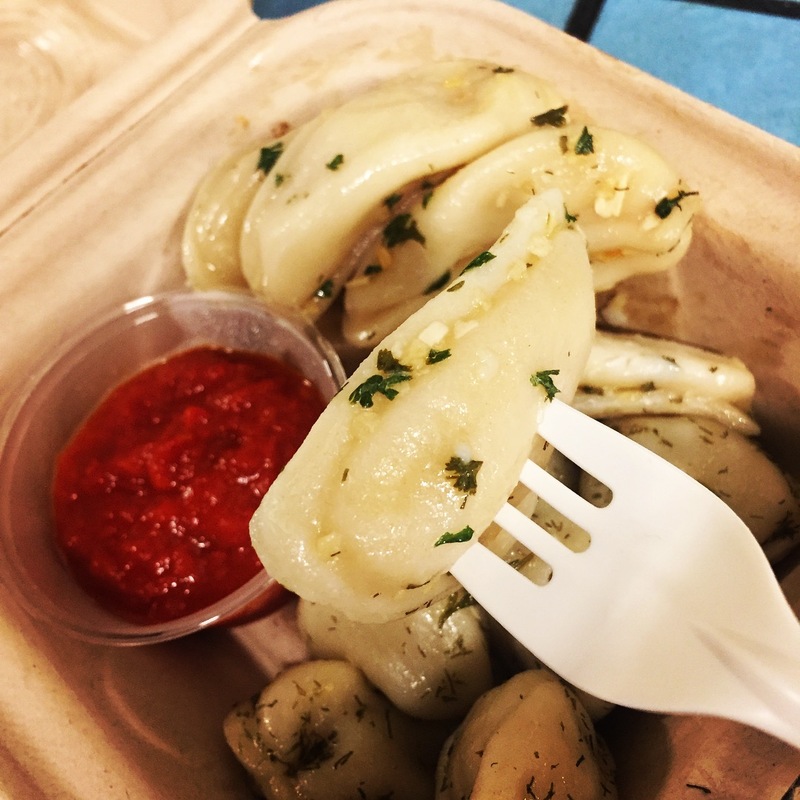 The pelmeni are served brushed with butter and with chopped herbs scattered on top. They also sell 2lb bags of frozen Pork or Chicken pelmeni for $13 a bag. The Pork pelmeni are small ball shaped dumplings with very thin wrappers that didn’t stay intact through the boiling process. The pork filling was tasty with a flavor profile that was slightly different from Asian style pork dumplings. There were no soy and sesame oil notes and more black pepper and herbal aromatics, likely chopped garlic and onion which most recipes on the Web include in the filling mix. I enjoyed these dumplings, BUT as someone who is allergic to chicken and is also a committed pork-aterian, I was pissed to discover after eating these pelmeni that Daa! Dumpling mixes chicken into the pork filling – they need better ingredient labeling on their menu. 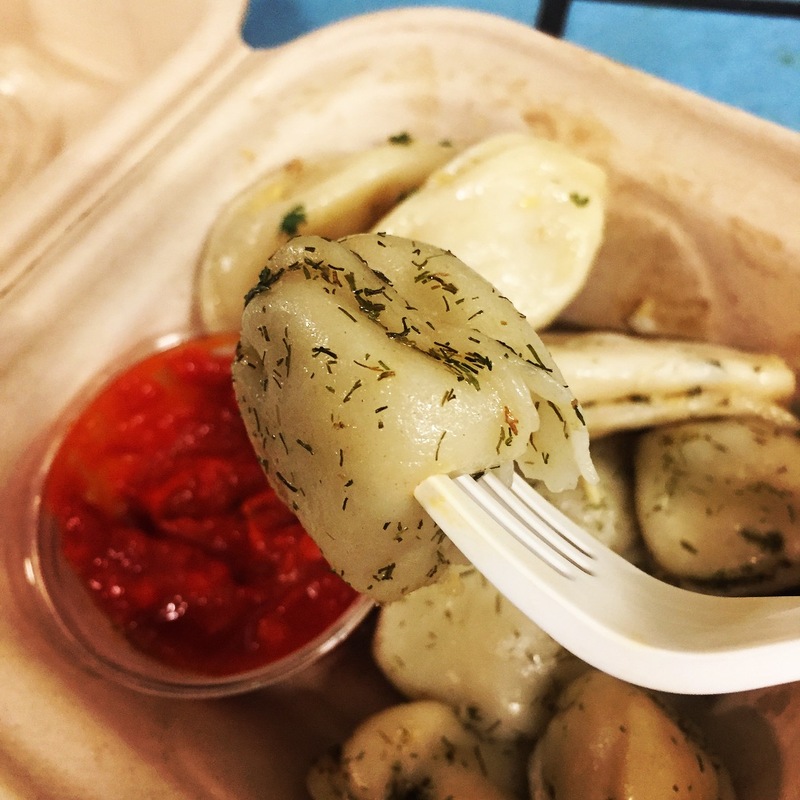 The Potato pelmeni are larger than the Pork ones and have the crescent, half-moon shape of Pierogis or Guo Tie, but are smaller than the Pierogi served at the Ukrainian and Polish restaurants in the East Village. The dough wrapper was thicker than with the pork ones and had a slight chew to it, which was good with the buttery mashed potato filling. I really enjoyed these dumplings. Dipping Sauce: There are four sauce options; sour cream which is free, and Adjika Tomatoes, Sweet Peppers and Mustard Mayo which each cost an additional 25 cents. I tried the Adjika sauce which is a thick, mildly spicy tomato based sauce which is usually made with red peppers, garlic, herbs and spices. This sauce went really well with the potato pelmeni. The Location: The TurnStyle underground arcade is beneath 8th avenue between 57th and 58th streets at the intersections of the Hell’s Kitchen, Lincoln Center and Midtown neighborhoods. Daa! Dumplings is more or less midway between 57th and 58th streets. This entry was posted in Boiled, New York City, Pelmeni, Pierogi, Pork, Varenyky. Bookmark the permalink.